As mega cricket carnival has entered into knock-out stage, billions of Indians are glued to their TV sets and will remain there till April 2. We celebrate cricket as our unanimous religion with ultimate gusto while admiring every shot hit by our batting maestro Sachin Tendulkar and cheering as and when Zaheer Khan delivers his inswinging yorkers, which send batsmen’s stumps for a toss. But is the game done? Certainly not. The game of cricket has a lot more to offer to the fans in terms of excitement. If you watch closely, the pattern of playing adopted by a team throughout an inning is quite similar to that we need to adopt for our investment policy. As each and every cricket rule is fresh in our mind, let’s see how well do these cricketing rules work in planning the investments? Let’s put a 50-over inning, equivalent to Ram’s life, a 25-year old young professional. As things unfold at the start of a cricket inning and batsmen try to adjust according to the conditions, getting their eyes in. Similar is true with investment, where an insurance policy can provide several advantages after taking higher risks in the beginning. The risks in any cricket match involve fielding restrictions (mandatory power play), fresh pitch, new ball etc. The higher risks taken are justifiable by looking at the resources (wickets) in the bank, which can steady things in later stages, if something goes out of hand in the early stages. This can continue till first 15 overs, involving bowling power play, wherein batsmen continue to have high risk exposure despite additional caution for bowlers. Likewise for investments, one needs to have caution first before he sets for high risks. Set up an emergency fund, equivalent to at least 3-4 months’ salary to counter unforeseen events like that of joblessness, etc. It’s an immediate term insurance for you, if anything goes wrong (similar to batsmen adjusting to conditions). Just like batsmen, Ram has young age & no dependents, which adds to his advantage. Hence, he should invest in riskier asset classes, such as diversified equity mutual funds, direct equity, gold ETFs, etc., for a long tenure. These instruments are riskier but have a potential to give high returns. Also, the risks involved will average out in long-term. In fact, equities tend to outperform all other asset classes. During last ten years, between March 2001 and March 2011, Sensex has risen at CAGR (Compound Annual Growth Rate) of 15.3%. After all, early cricket overs are not all about boundaries (high risk). Even best batsmen get good balls that they must respect. Also, they are bound to be lateral movements, rash running, shots etc., to avoid wicket loss. In such a scenario, keeping the scoreboard ticking with singles and twos becomes an ideal mix to boundaries to keep the run-rate high. Similarly, for Ram, it’s imperative to diversify into some assured returns instruments such as debt-focused mutual funds, government bonds, FDs, PPFs, NSE, pension plans etc. As a rule of thumb, Ram must allocate 25-30 per cent of his money to debt instruments to diversify his portfolio. This will provide him a hedge against his higher risk exposure in difficult times like that of recession. Here, debt instruments will ensure steady cash inflow. Early Stage Strong Foundation: Batsman takes enough risks to ensure good foundation as well as good start, while keeping in minimum safety level. Typically, one batsman goes for shots, while other one plays his natural game. Asset Creation: Take advantage of young age, invest in riskier assets, but avoid overdose by keep a fraction into debt funds. Diversification is the key. Middle Stage Consolidation: With spread out field, batsman builds good foundation while taking amount of lesser risk but capitalizing on anything that is loose. On has to keep the momentum going into slog overs with wickets intact. Asset Accumulation: Accumulate assets by keeping a systematic approach. Invest in long-term assets, like house/ property, PPF, SIP etc., for secured retirement. Slogging stage Leveraging good work: Unleash your fire power to get a competitive total. Don’t bother about few wickets in the process. Good foundation build earlier pays you back. Asset Distribution: Your systematic investments will pay you back for crucial events like that of child education, marriage, health expenses, retirement, etc. A long-term investment view for Ram echoes any batsman’s view to play as long as possible even playing his shots initially. But investors may well use ‘pinch hitter’ in commodities/currency future to up their returns in a short run. They are highly volatile in nature and require expert knowledge & forecasting ability to gauge the unseen. Here, Ram should very careful invest in commodities/currency, so that at the end of early age years, he would be able to have significant appreciation. This period may last till Ram has responsibilities. By the end of early overs, it’s a consolidation time for batsmen in the middle overs, generally regarded from 15-40 overs, when the field is spread out (no field restriction apply) and spinners take over. However, the systematic play always need an insurance of a decent partnership upfront, so that coming batsmen will not be under stress to increase the scoring rate as this might cause in loosing wickets in a hurry. Similarly, for in middle-aged years (termed as post marriage scenario), an insurance is a must, considering the increased liabilities toward dependents (wife & children). Ram must take a term plan of at least 10 times of his yearly income that will take care of his dependents in case of unfortunate death. He can also invest in a ULIP product to achieve dual benefit of insurance and investments for a long-term. For example, a child ULIP with premium waiver rider will ensure that in case of unfortunate untimely death of parent, future premiums are waived off and will be paid by the insurance company and the plan is continued as normal. He can also go for a family floater health insurance policy to cover healthcare expenses. At batsmen continue accumulating singles or doubles without taking much risk, wise investors do the same by investing in diversified mutual funds through SIP route. 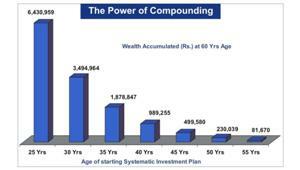 The magic of compounding would ensure a substantial corpus for him at retirement. For example, a SIP of Rs 5,000 in HDFC Equity Mutual Fund for 25 years would fetch him around Rs 1.36 crore. The systematic play would also involve investing in real estate (house). It’s an important asset class as beside a basic need, returns from real estate generally beat inflation in long run. 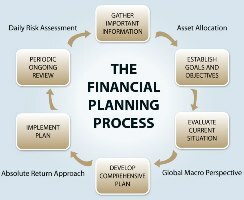 If financed, term plan taken earlier would cover up home loan liability. On debt side, Ram should continue systematic investment in PPF, debt funds, FDs, NSE through ladder, pension plans etc. Cricket matches always has few twist in the tale. Consider the team taking ‘batting power-play’ in the middle overs to catch up with overall net run-rate. Likewise, Ram amidst steady accumulation, can exploit short-term (2-3 years) riskier avenues like corporate FDs, Fixed Maturity Plans, Sectoral Mutual Funds, etc., to earn higher returns. These instruments are suitable for short-term goals such as buying a car, holiday vacations, jewellery, etc. If short-term goals are such where principal cannot be risked, e.g., down payment of house, then investing in short-term FDs or building a ladder of bonds, will be a good idea. It’s similar to what batsman’s short-term goal to quietly sail through 4-5 overs till the mandatory ball change after 34 overs. It also signals the strategy of diverting funds from equity to debt instruments typically 4-5 years ahead of the retirement. It’s a prudent idea not to risk your principle, nearer to when you need them. In cricket, strong foundation of early overs and steady accumulation during middle overs pay in terms of strong base with wickets in hand, so that team can unleash its power by hitting in slog overs to get higher scores, pushing run rate. Likewise, your systematic investment approach through both equity & debt measures will make your life easier after retirement. For example, child ULIP plan or partial SIP contribution may look after Ram’s planned liabilities like that of child’s marriage/education; while corpus build through PPFs, debt funds, equity funds etc. will take care of his retirement needs. Assuming life expectancy of 80 years and inflation at 6%, SIP proceed of Rs 1.36 crore, alone would be sufficient to meet his monthly expenses of Rs 25,000 for next 20 years. Not to mention his tax-free PPF corpus, which he can further be invested in buying pension annuities, short-term deposits etc. And of course Ram’s house will be a precious legacy for his loved ones, a benefit earned from a disciplined investor father.